In May 1867, Reverend Samuel Small and ninety members withdrew from the white First Baptist Church, and organized a church that they named "Mount Moriah Baptist Church." 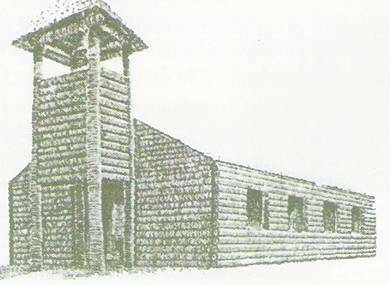 The former slaves constructed the church of 30' x 50' logs near the present site of Firestone Tire Company on South Pine Avenue (Hwy 441). The membership of Mt. Moriah came from all parts of Marion County. A growing number of residents of Shady Grove community traveled all the way to Mt. Moriah to worship, because they did not have a church in that community. Over the years, their journey to Mt. Moriah became long and tedious, so those faithful ones saw the need to establish a place of worship in their own community. Reverend Small helped them to establish the Shady Grove Baptist Church in 1874. In the fall of 1899, during a regular church conference, a discord arose over the call of a pastor. After prayerfully trying to settle the differences, they saw that separation of membership was inevitable. A group of members withdrew and formed the Covenant Baptist Church. In 1906, another group withdrew and organized the Hopewell Baptist Church. In 1911, A. E. Delouest sold to the membership property that we now know as 55 S.E. 3rd Avenue. Church Trustees soon satisfied the balance in full of our very first mortgage. Two frame buildings were constructed on the property an edifice for worship and a seven-room parsonage for the pastor and his family. In 1924, under the pastorate of Reverend J. M. Mells, the construction of a new edifice was begun. The basement was completed and for many years it served as the main auditorium. Construction continued and eventually there were two buildings on the site a wood structure for worship, and a large unfinished stone structure. Over a period of nine years (1933-1942), two other ministers were called as pastors - Reverend C. P. Brown and Reverend W. H. Pelham. In 1942, Reverend L. N. Anderson, a very affable minister, gave excellent spiritual leadership to the growing congregation for more than twenty years. He resigned as full-time pastor in 1962 due to failing health. In April 1964, the Reverend Frank G. Pinkston, Sr. was called as pastor. He had earned the Bachelor and Theological degrees from Virginia Union University. He had served as assistant to his father, the Reverend O. Van Pinkston, pastor of Covenant Baptist Church. He was a dynamic and dedicated man of God, and was referred to as the "Black Liberator of Marion County" for his leadership in our Civil Rights movement. Gaining the support of church members and officers, Reverend Pinkston spear-headed a clean-up campaign for the church buildings, and embarked upon a drive to build a new church. With God's guidance and sound financial planning, a loan was soon secured. The old buildings were demolished and construction began on the new church. On the first Sunday of December 1966, the membership marched into the new church. With the growth of the membership, Reverend Pinkston began reorganizing the church. A new budget system was adopted, auxiliaries and ministries were improved, and an increased emphasis was placed on youth involvement in worship and other services and activities of the church. His mission completed, in 1967 Reverend Pinkston accepted the call to pastor an out of town church. In December 1968, our present pastor, Reverend Doctor Lorenzo S. Edwards, Sr., was called. He, also a native Ocalan, was a young man and new to the ministry. However, he was blessed with the spirit and potential to lead. Reverend Edwards earned the Bachelor and Master degrees from the University of Florida. He was awarded the Honorary Doctorate Degree from the International Interdenominational Seminary. He, a life-long learner, has completed extensive Theological study, and has taught classes and conducted seminars for ministerial students. He served for ten years as an Ocala City Councilman, and also serves on the Executive Boards of many organizations throughout the county. He is a retired Program Director and Dean with Central Florida Community College. Under the leadership of Reverend Edwards, an additional five pieces of property have been purchased. These properties were renovated into a multi-purpose facility with classrooms for Sunday School, Bible study, academic tutoring, dining and multi-media resources. The facility also houses the Mt. Moriah Community Center, where food, clothing and referral information are provided to those in need. Other properties are the sites of the Mt. Moriah Walking Trail, and the Mt. Moriah Health Ministry. Auxiliaries were also reorganized and expanded to better meet the needs of the growing congregation. In December 1996, construction was begun on the expansion and renovation of the sanctuary. On Sunday, May 11, 1997, a grateful and exuberant membership marched into the new sanctuary. The Mt. Moriah family has always endeavored to give the "best of their service" for the cause of Christ. In a span of more than 138 years, this body of Christ has shared, worked, worshipped, prayed, praised, played, planned, served, and received inspiration to continue steadfast in the faith which has brought us thus far. We honor the future by remembering our past with gratitude, faith, and belief in our Lord and Savior!